We are in the midst of First Communion Season at my parish and it brings back very sweet and not so sweet memories of my own First Communion and First Reconciliation. After all, if you are going to receive Our Lord, you want to make sure the inside of your soul is as clean as it can be. Confessing my sins has never been my favorite thing to do. Taking ownership for what I have done wrong, is still a challenge for me. Must be my Irish pride or my stubborn German heritage. I am genetically predisposed to not enjoy the process. After all, I am perfect aren’t you? My First reconciliation was a Wednesday morning in late April a few weeks before my First Communion. How do I remember that? Trauma sticks with you people. You never forget the trauma. I had carefully written down every sin I could think of on one of my Dad’s 11×14 legal pads to prepare for my First Reconciliation. Three whole pages of what a horrible daughter I was and how I had taken my little brother’s candy bar from his Easter basket a few weeks prior. Father Madigan had chuckled when when he heard me turn the page on the other side of that screen. “How many more do you have Mary Beth?” I was stunned into silence at hearing my name and whispered “Two more pages Father.” He encouraged me to continue and patiently listened to every single thing I had written down. Then I cried and told him how very sorry I was and how I would never do these things again. As the tears fell and I waited for him to give me absolution, suddenly the door to the confessional opened and their stood Father Madigan with his arms open wide. I ran into his arms and he just shooshed me and patted my back. He told me something in that moment I have never forgotten. “Whenever you feel like hitting your little brother or telling your Mother “no”, just ask Jesus’s mother Mary to help you be good. She will always be there for you. After all you share her name. How can she say no.” He quietly gave me absolution and then took the next person in line. As I was coping with the fact that my classmates had seen me cry (humiliation thy name is Mary Beth), what Father had just said sunk in and I knew I was doomed. Holy Smokes. What did that mean? I am not the Blessed Mother. She is good. I hit my brother when he touched my stuff. I can’t carry St Elizabeth’s name. She gave birth to John the Baptist, I told my mother I wanted to send back my new baby brother because he was too loud. I decided that I needed a new name. Like now. After dinner that night I told my mother what Father had said. I asked her why she and my Dad had given me the name “Mary Elizabeth”. I felt like I was set up to fail because I couldn’t share a name with the Blessed Mother. She’s the Blessed Mother and I was just Mary Beth Green who lived with, now, six stupid brothers who annoyed me. Why or why did they give me that name I cried out. “Proud of my name…” no pressure for sure. Being seven was hard enough. All that addition and subtraction and carrying over numbers and spelling words and memorizing the Baltimore Catechism so I could receive my First Communion, and…and…and…and carrying the Blessed Mother’s name…just too much. That night as I knelt in the living room with my brothers who were old enough to kneel, saying our bedtime prayers in front of the big crucifix, my Dad added a little something to make me feel better about carrying such a heavy burden. He went on for David and Andy but I was stuck at Richard because I had forgotten that his middle name was Simon, like Simon Peter, so I don’t remember what else Dad said. I think of that often. “Beauty and Strength“. That’s what Dad had said. Of course I thought of those things in physical terms as a child.Was I really that pretty? Was I strong? I didn’t want muscles like the boys had. Those were ugly. I wanted to float like a ballerina. They were beautiful. Today I understand what a gift my name is. Yes, it is an awful lot to live up to but it’s also very true what Father Madigan said. The Blessed Mother and I share a name. How awesome is that? Not only that but I also share a name with John the Baptist’s mother, a women who never thought she would be a mother at all. But she persevered in prayer listening for that still small voice of the Lord to answer the plea of her heart and he did. Both of these women trusted the Lord with their entire lives. Both of these women went through great trails and remained steadfast in their faith. Both of these women changed the course for history by saying “yes” to the Lord and his plan for their life. At seven I didn’t get it. All I saw was how different I was from both of these women. Today I thank God for revealing to me ever so slowly over the decades what it means to do as they did. To say “yes” and remain steadfast in faith no matter the circumstances. Thank you for the gift of our names given to us in love at Baptism. Thank you for remaining by our side no matter how far we wander from you or your son. 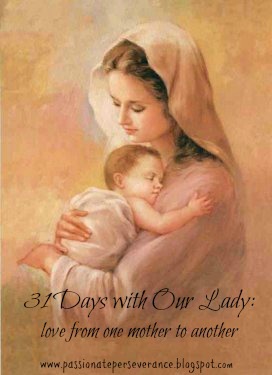 Help us Dear Mother, to remain steadfast in faith, honoring the plan God has placed before us for our life. Help us to honor the saints and family members whom we are named for, so that we may always show beauty and strength in our deeds and in our words. Would your Father Madigan be the same as the one and only Msgr. John Madigan who so faithfully and lovingly served in the Archdiocese of Washington, DC for so many years? If so, your report of his response to your first confession sounds just like him! Why yes it would be AC! He was awesome. I miss him. He was indeed awesome! And he always made me smile and laugh. The last time I saw him was 12 years ago when I was visiting family and friends in the DC area. What a joy it was to have a brief visit with him! He was such a good, dear man and a wonderful priest. Thank you, dear Lord, for Father Madigan! Love this Mary! I think you are doing a great job of living up to your names!